One of the primary purposes of the Virtual Humanities Center is to provide public access to archival and performance materials. As educators, the VHC collections provide a valuable resource for teaching materials. Below is a collection of materials in the VHC collections which are being used by faculty members in their classes. 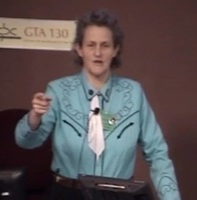 "Temple Grandin spoke on the GBC campus in January 2014. Her speech tied her experiences with cattle, processing to solve problems, and her special needs in education in an informative, thoughtful presentation. This presentation is now used to connect the curriculum to real life situations and applications in the EDSP 301, Teaching the Exceptional Child, course. Students note the references to school life in her talk, they note the characteristics of students with special needs, and they comment on the need for their future classrooms to be safe and peaceful places of learning for students with similar needs. Thank you for the opportunity to use this presentation to broaden the understanding of students with thoughtful discussion and the creation of tools to aid in the understanding of learners for pre-service teachers. This production and others like it are valuable tools in enhancing the humanities understanding in teacher education courses." Sometimes, a portion of a talk by a visting scholar touches on an issue discussed in class, even though the topic of a talk may be utterly unrelated to the course. In my HIST-106: European Civilization to Present, I discuss the concept of civil society--the coming together of of people to discuss shared interests--in relation to the changes coming about with the Enlightenment. The historical process is illustrated by having students read Immanuel Kant's "What is Enlightenment?," a 1783 newspaper editorial proclaiming the advantages of Enlightenment but also discussing the need for the distinction between the private and the public use of reason. In many ways, our modern political cultural continues to be influenced by Enlightenment ideas, including that of associational life. 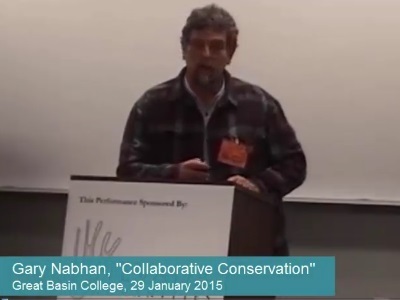 Below is a brief video by Gary Nabhan, one of the keynote speakers at the 2015 Cowboy Poetry Gathering. In this segment, Nabhan discusses how the same forms of associational life that emerged during the Enlightenment continue to influence how we conduct our political disputes today here in the West, even in the heated controversy of land-use issues. Have a short tutorial on putting together video clips? The VHC would love to incorporate it into the Humanties Toolkit!